Kupo! I was super excited to see this month’s Monthly Stitch theme: geek out! 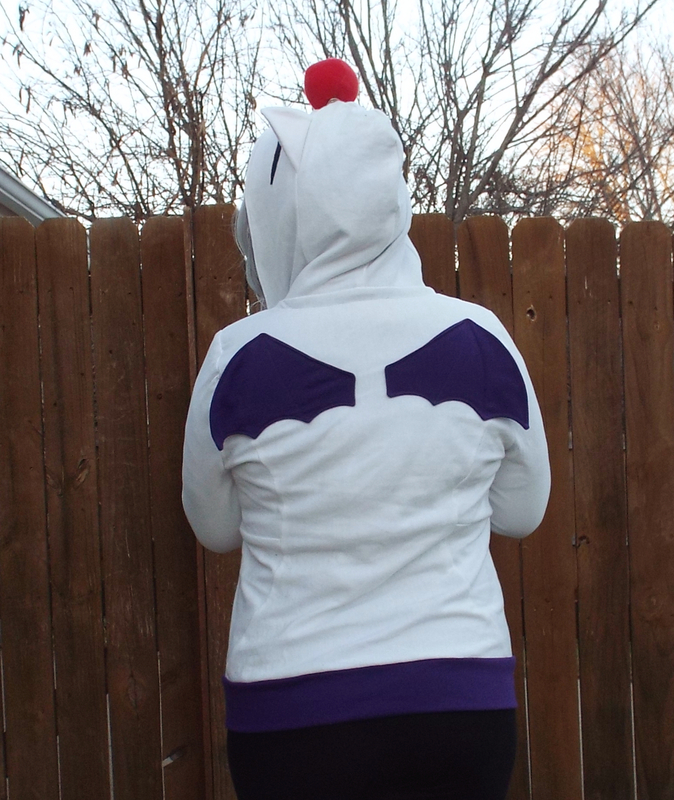 I’ve been thinking about making a moogle hoodie for a while, and this was the perfect opportunity. 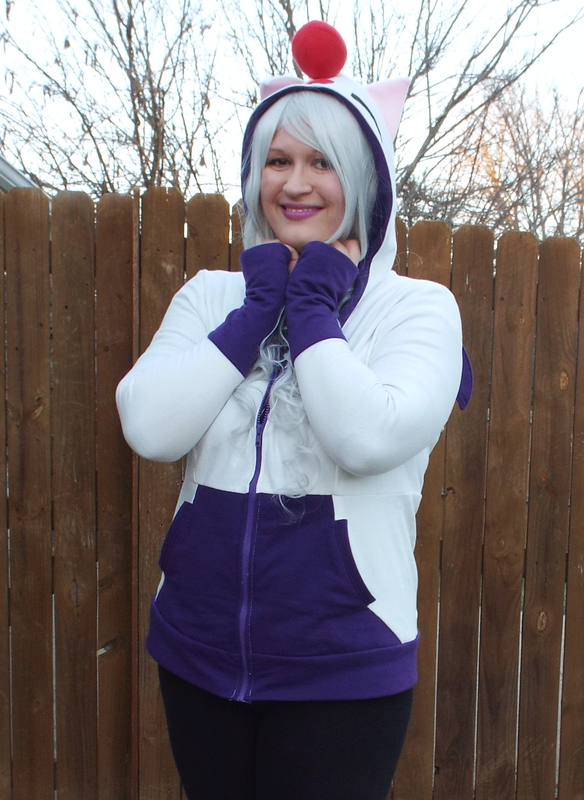 My boyfriend also mentioned that he’d like a Final Fantasy themed hoodie, so of course I went into WE MUST HAVE MATCHING THINGS mode. Sadly, this will probably the closest I’ll ever be to getting him in cosplay. Still, I’ll take it! If you’re not familiar with moogles, they’re a race of teddy bear/bat-like creatures from the video game franchise Final Fantasy. They’re insanely adorable and one of my favorite creatures from the FF series. I could go into a lengthy explanation of why I think they’re so cute, but I think this video from the FFXIV King Mog boss fight does a pretty good job. I feel like this song belongs in The Nightmare Before Christmas. Very Danny Elfman-esque. But I digress. I originally tried making this project with cheap anti-pill fleece from Jo-Ann’s using McCall’s 6614. It was okay, but not quite as awesome as I hoped. I set the project aside to work on Princess Jupiter and Stanley Tweedle. When I started again, I went with the Avacado hoodie from Seamster Patterns. It’s a fantastic design and gave me lots of opportunities to play with color blocking. The only part of the hoodie that gave me pause was the front pocket. Fortunately, Mari made a video tutorial describing the process. In terms of fabric, I went with French terry and purple sweatshirt fleece from Girl Charlee. The terry is okay. It’s very shed happy, so I made sure to serge all the seams. I would have preferred white sweatshirt fleece, but GC didn’t have white when I ordered. Oh well, no big deal. On the plus side, the terry is quite warm. The face appliques were the most time-consuming part of this project. 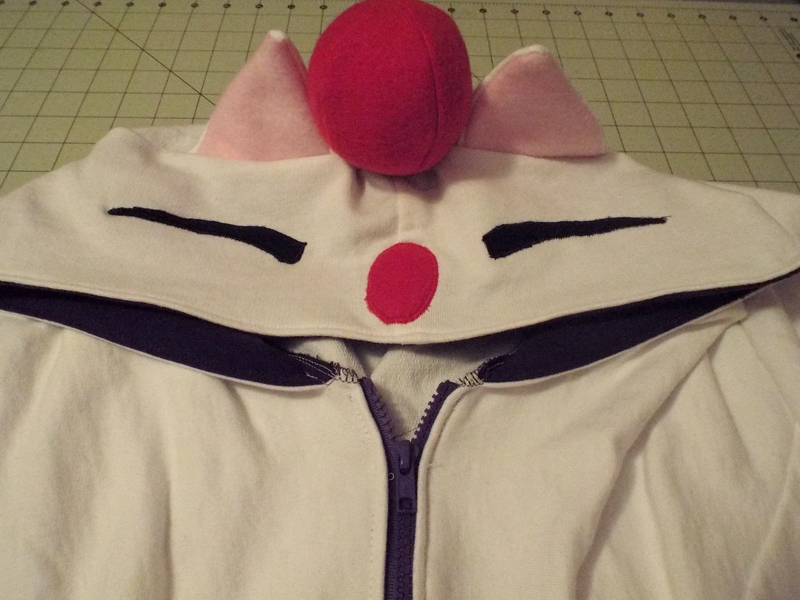 I used scraps of black, red, and pink fleece for the ears and the face. The face pieces were fused with applique paper and then satin stitched to the terry. I made the red head bobble with red fleece and then stuffed it with batting. I originally wanted to attach it with pipe cleaner, but it was too heavy to stay up. Instead, I attached the bobble with a large heavy-duty snap. 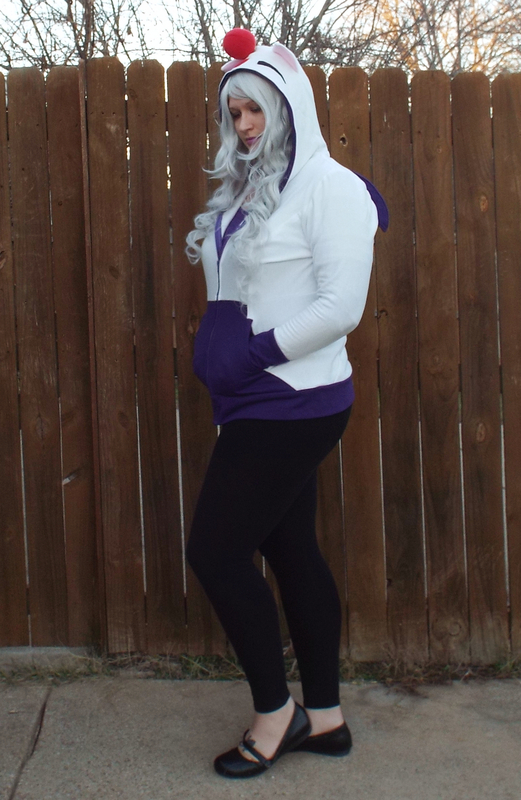 This actually works out better overall, since now I can remove the bobble to wash the hoodie. I absolutely love the wings. I drafted them using this pattern as a guideline. I doubled them up and top stitched them down just above the princess seams in the back. I left the edges of the wing free so they sort of flap when I walk. Fabric: 1.5~ yd. French terry, 1~ yd. purple sweatshirt fleece, and black, pink, and red anti-pill fleece for the face. 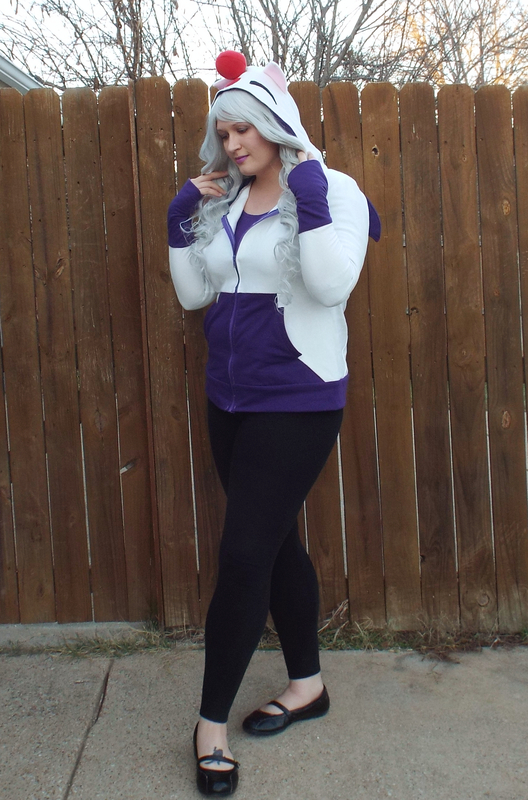 Alterations: I slashed the hood and added 5/8″ seam allowance to create room for the ears. 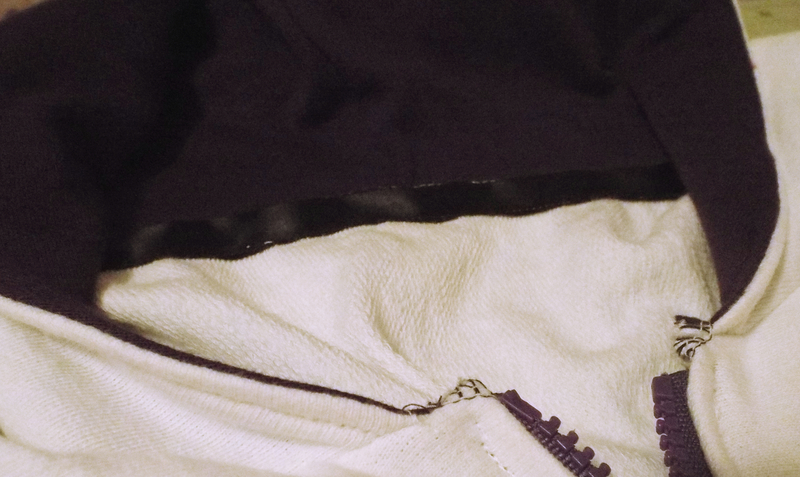 I also added a zipper to the center front. Also did a small FBA and added ribbon to the neckline to reinforce it. Notions: Thread, zipper, applique paper, twill tape, batting, snap. Make it again? : Probably. I’d love to have a couple of regular versions of this hoodie for everyday wear. 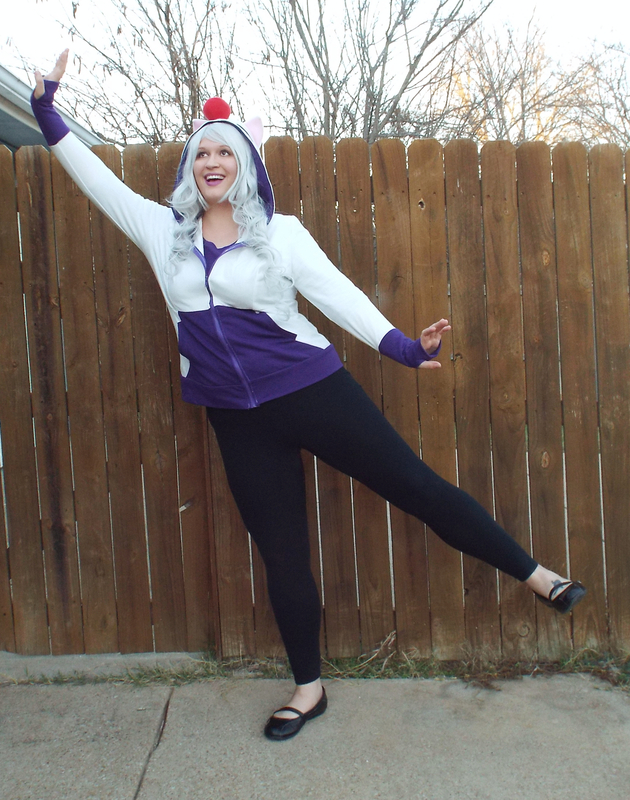 Favorite parts: Other than prancing around as moogle? I really like the overall shape of the hoodie. The princess lines are very flattering, and I love the thumb holes. Other thoughts: I adore this hoodie. It’s very happy making. I don’t think I’ll make another one for myself (though if someone wants one, I’d be happy to take a commission! 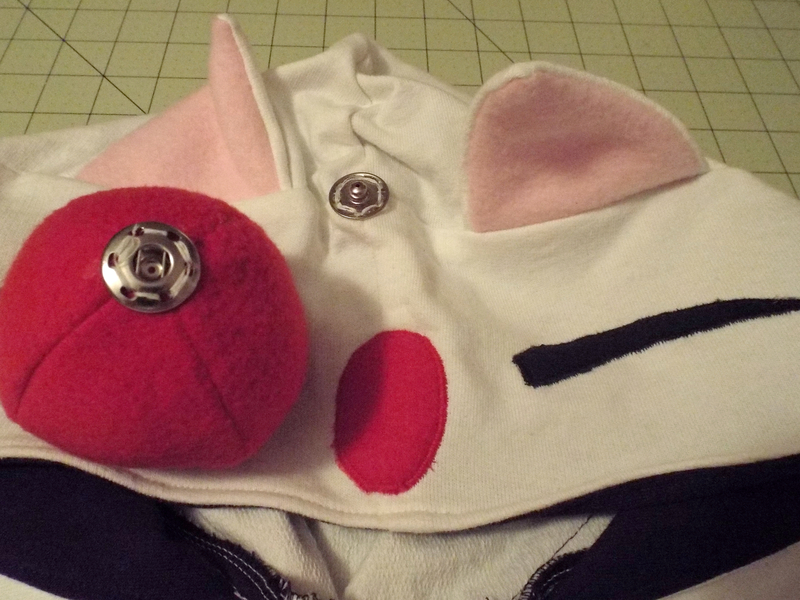 ), but if I did, I’d make the ears a little smaller and add interfacing to keep them up. The terry really didn’t want to stay up, but the fleece helped with that. I’d also add the ribbon all around the neckline prior to adding the zipper for a cleaner finish. What’s your favorite Final Fantasy creature? This is so awesome! 🙂 Great job on it all. The way you attached the bobble was a stroke of genius. Thanks, Andie! Hope your fabric arrives soon! What are you making? Casual cosplay of Wonder Woman. 😀 I can’t wait! Thanks, Jessica! They’re so adorable. I have three moogle plushies from various FF games, but I need a Kingdom Hearts one! It came out fantastic! I can’t wait to see it in person. 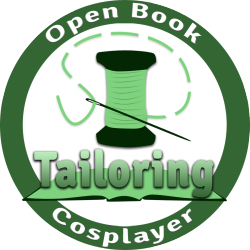 🙂 I’ve been wanted to make a geeky hoodie or beanie for a while, but have no idea of what. Oh my goodness! This is so cool, and you look great! This is spectacular!! I absolutely love it. Came out perfect, and I love that the bobble is detachable. Brilliant! Thanks! I was kind of bummed to not have an antenna, but this is ultimately the more practical solution. Works out pretty well for washing! It looks awesome!!! So cute! Thanks, Fiona! Can’t wait to come up with more character hoodies while the weather is still cold here. OMG! That hoodie is SUPER cute! And it looks great on you!